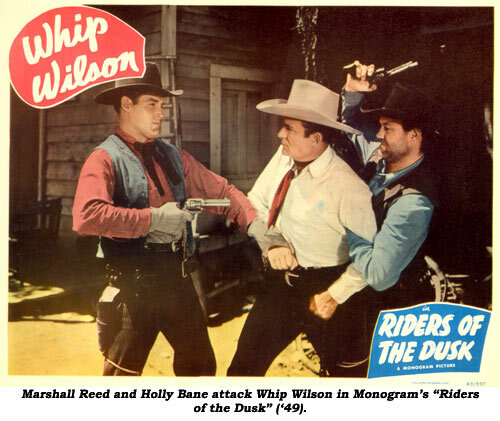 Holly Bane, who changed his name to the more male sounding Mike Ragan midway in his badman career, was one of the best and busiest “second generation” B-western heavies of those that came along after WWII. 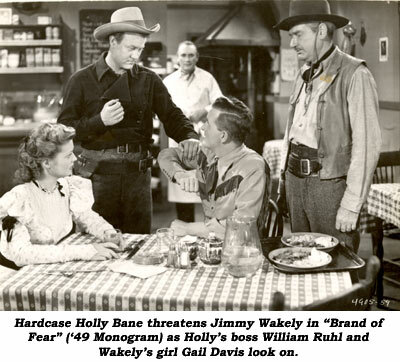 Hollis Alan Bane was born February 18, 1918, in Los Angeles, California. His father, John Bentley Bane, hailed from Illinois while his mom, Gladys Opal Turnmire, was from Indiana. 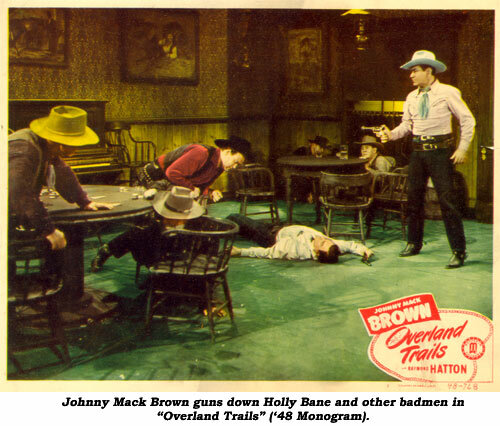 As a boy Holly lived in San Francisco as well as Los Angeles where he obtained his first job as an office boy at MGM circa 1932. At the young age of 15 he left on his own for San Francisco once again to try his hand at the big band business. However, he soon returned to Los Angeles, taking an interest in the makeup department and becoming an apprentice in the craft. One of the first films he worked on was MGM’s “The Good Earth” (‘37) under the supervision of Jack Dawn. As a makeup artist at MGM and RKO he worked with such stars as Clark Gable, Greta Garbo, Hedy Lamarr and Spencer Tracy. As an actor, he first appeared as a 1st Lieutenant in “Wake Island” (‘42). His makeup work and aspirations to be an actor were then interrupted when he spent four years with the Marines during WWII. 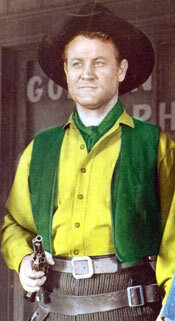 Returning to RKO circa 1945, he did makeup on various Robert Ryan and Robert Mitchum pictures before deciding to make acting a full time job with “Buffalo Bill Rides Again” (‘47 Screen Guild). 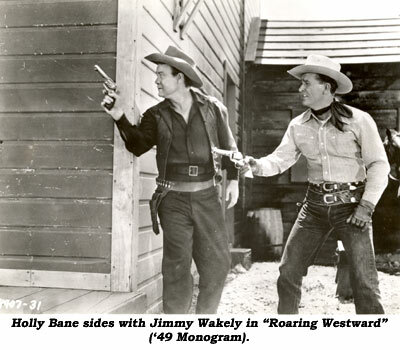 Bane connected at Republic, becoming an actor they frequently used in the latter days in “Rocky” Lane, Monte Hale and Roy Rogers pictures as well as seven serials beginning with “Jesse James Rides Again” (‘47) and ending with his biggest role in “Panther Girl of the Kongo” in ‘55. In 1961, Bane briefly returned to makeup when he did the makeup for the TV pilot of George Nader’s syndicated “Shannon”. When the show sold, Nader asked Bane to remain, but he preferred to stick with acting. However, with work in westerns nearly dried up by 1966, he returned to makeup once again, later working on such popular series as “Welcome Back Kotter”, “Fish”, “Barney Miller” (where he was makeup department head for a time), “Family Feud” and “General Hospital”. Bane’s hobbies were many—he was an inventor, painter, designer, avid swimmer and sportsman (at one time he played pro-baseball and boxed). He was married for 30 years to character actress Dorothy Ford (“Three Godfathers”, “Sands of Iwo Jima”, a couple of Bowery Boys titles, among others) and they lived at 13906 Fiji Way in Marina Del Rey, California. He did a stint in makeup for the local ABC news affiliate in Los Angeles in the early ‘90s but retired in ‘92. Bane, 77, died August 25, 1995, at Vencor Hospital in Los Angeles of cardiorespiratory arrest, complicated by emphysema. He’d been hospitalized for five months, with a tracheostomy performed on April 11, 1995. Bane’s remains were cremated and scattered at sea by the Neptune Society off the coast of San Pedro, California.